In order to settle the Karine Hagemann Estate, we will offer the following real property at auction at FARM #1 – located at 44396 226th St. Ramona, SD; From: Ramona, SD (south side) – 5½ miles west on 226th St.: From: Oldham, SD (4 way stop) – 8 miles south on 445th Ave to 226th St & 1 mile west: From: Madison, SD (Jct. Hwy’s. #81 & #34/Pizza Ranch Corner) – 8 miles west to 446th Ave., then 7 miles north & 2 miles west on 226th St.: or From: Jake’s Corner at the Jct. of Hwy’s. #34 & #81 – 1 1/3 miles east to 442A Ave. (Lake Co. Hwy. #59), then 7 miles north to 226th St. & 1½ mile east. Auctioneer’s Note: This auction presents an excellent opportunity to purchase some productive and well located Lake County, SD Land. These farms are well located west of Ramona, SD in northwestern Lake County, SD and both are bordered on the south by a County Oil Highway. Each of these farms will be offered individually. 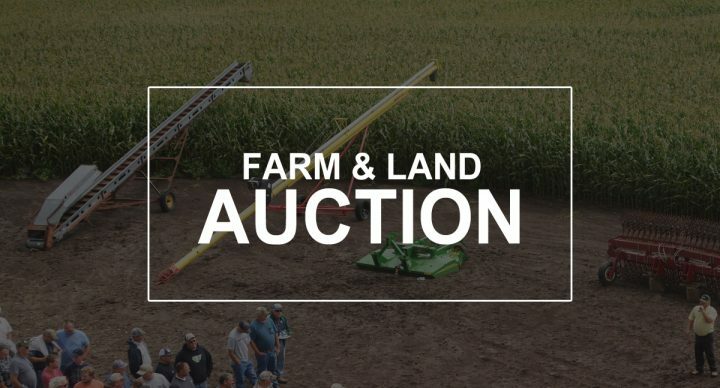 If you are in the market for a parcel or parcels of productive Lake Co., SD farmland to add to a row crop farming operation or as an investment, then make plans to inspect this property and be in attendance at this auction. FARM #1: +/-161.12 Acres – LEGAL DESC. : The SE¼ of Sec. 32 T.108N., R. 54W., (Wayne Twp.) Lake Co., SD. This +/-161.12 Acre Farm will be offered as an individual parcel of land. This property has remnants of an old farmstead inclusive of a mobile home and some older farm outbuildings – all of which are in very poor condition, with limited, if any utility. According to the Lake Co. FSA information this +/-161.12 acre farm as a unit has approximately 141.42 acres of cropland, with the nontillable acres comprised of an abandoned farmstead, 2 dugouts, trees, waterway & roads; FSA indicates that this farm has a 37.02 acre corn base with a 103 bu. PLC yield and a 1.72 acre soybean base with a 55 bu. PLC yield and is enrolled in the County ARC election of the USDA farm program. The abandoned farmstead on this property consists of some remnants of the buildings, although there is Kingbrook Rural Water and rural electricity servicing the property. The general topography of this land is gently rolling to rolling. The Lake Co. Assessor indicates this land has an Overall Soil Rating (OSR) of .816, comparatively Surety Agri-Data info. indicates the land has a Productivity Index of a 80.1. The RE taxes payable 2018 on this property were $3,530.30. This is a parcel of land that would make a nice addition to an area row crop farming operation. FARM #2: +/-157.99 Acres – The SE Corner of Farm #2 is at the Jct. of 443rdth Ave. & 226th St.; located from the SW Corner of Farm #1 – ½ mile west on 226th St.; or from Ramona- SD (south side) – 6 miles west on 226th St. LEGAL DESC: The SE ¼ of Sec. 31, T. 108N., R. 54W., (Wayne Twp.) Lake Co., SD. Farm #2 has a relatively high percentage of tillable acres, as according to FSA information this +/-157.99 acre parcel of land has approximately 143.39 acres of cropland with a 42.98 acre corn base with a 103 bu. PLC yield and a 2.09 acre oats base with a 55 bu. PLC yield and is enrolled in the County ARC farm program election. This farm overall has some eye appeal and the overall farmability of this land has been improved in recent years by the efforts of the present operator; with non-tillable acres comprised of a dugout & lowland/slough area in the southeast sector of the farm, a small grassed area with a few trees in the NE sector of the farm, a couple of lowland pockets, waterway and roads. The general topography of this land is gently rolling to rolling. According to Lake Co. Assessor this farm has a soil rating of .809, comparatively information obtained from Surety Agri-Data, Inc. indicates this land has a soil productivity index of a .784. The RE taxes payable 2018 on this property were $3,399.42. This is a parcel of land that would make a very nice addition to an area row crop farming operation or investment. TERMS: Cash – A 10% non-refundable earnest money deposit on each farm sale day & and the balance at closing on or before Feb. 28, 2019 with possession. Full possession of this land will be awarded for the 2019 crop year. Personal Representative’s Deeds will be conveyed and owner’s title insurance will be provided with the cost of the owner’s policy divided 50-50 between the buyer & seller. All of the 2018 RE taxes payable in 2019 will be paid by the estate. The acres on both of these farms will be adjusted and in accordance with a survey as completed by Midwest Land Surveying, Inc., with the acres understood to be “more or less”. The sellers do not guarantee that existing fences lie on the true and correct boundaries and any new fencing, if any, will be the responsibility of the buyer pursuant to SD Law. FSA yields, bases, payments & other information is estimated and not guaranteed and are subject to County committee approval. Information contained herein is deemed to be correct but is not guaranteed. The RE licensees in this transaction are acting as agents for the seller. This property is sold in “AS IS” condition & subject to existing easements, restrictions, reservations or highways of record, if any, as well as any or all Lake County zoning ordinances. Sold subject to confirmation of the Personal Representative.